Need the best Aux cable for your sweet audio setup? Us too! 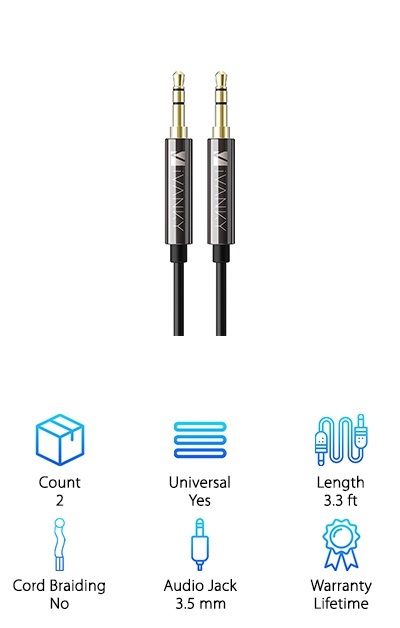 We’ve been looking for the perfect cables to help get the best sound and the best connection possible. So if you are in the market for the best auxiliary cable, you’ve come to the right place. We’ve compiled a list of our favorites after days of researching and reviewing all of the highest-rated aux cables we could find. We used a few stats to help us find the best of the best while shopping; we’ll break them down for you before getting into the reviews. Count - Aux cables usually come in single counts, but they occasionally come more than one in a pack. We’ll let you know how many amazing aux cables you’re getting with your purchase. 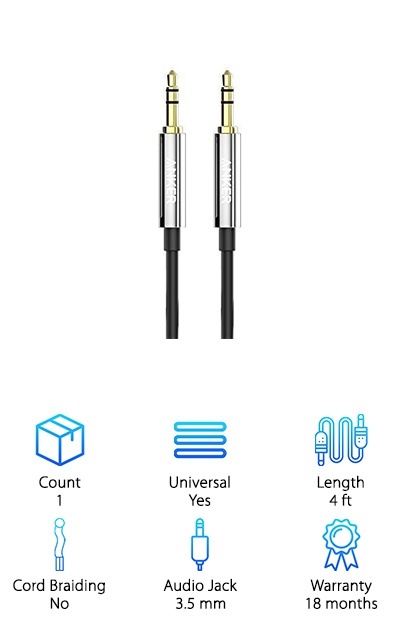 Universal - Making sure your auxiliary cable will be compatible with your devices is important. We’ll mark here if the aux cable is universal and will be okay with almost any device you own. Length - Need a long cord? A short one? Whether the cord length is three feet or twelve, we’ll measure it and note the length under this stat. This will always be measured in feet. Cord Braiding - Is the cord covered in braiding? Braid-covered cords can help prevent stretching, damage, and wear. But it does add a rough texture to the outside not everyone loves. 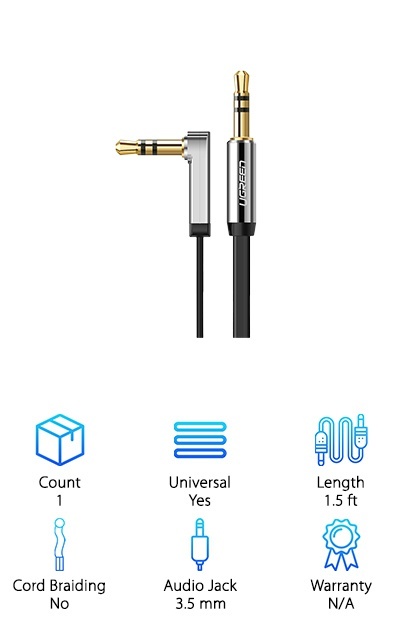 Audio Jack size - Nearly all aux cables come in 3mm; that’s the standard for most sound equipment that you would have in your home. We’ll note if the jack size is anything different. Warranty - How long is your aux cable covered? The warranty should prevent you getting a poorly constructed or broken aux cable to start with. We’ll measure the warranties in years. Now that all those stats are out of the way, we’re just about ready for our top ten! While every single one of these are high-quality aux cables, there were two that really stood out from the pack. In the first position is our number one Top Pick that really outdid all of the competition. The second will be our Budget Pick, a stunning, quality product that still manages to be inexpensive. If you’re in a hurry, be sure to check out at least those two! Now, onto the best aux cable reviews! Our Top Pick is the Cone Aux Cable! We think it’s the best auxiliary cable for sound quality. This aux cable is highly rated, durable, and universal. If you have a need for an aux cable, this thing will fit just about any device you own. It measures 3.3 feet in length, which makes it long without making it so long that you’ll get it tangled. 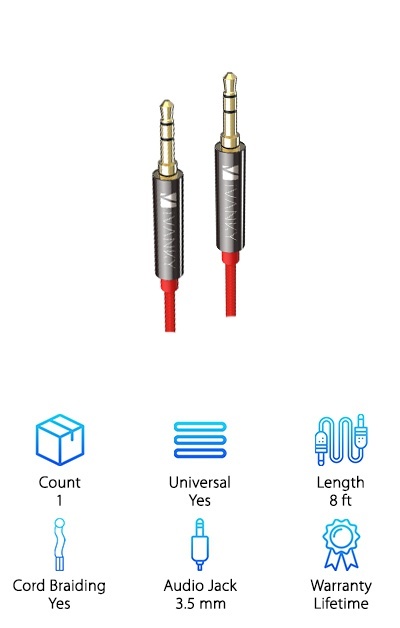 The chord is flexible and strong; the manufacturer claims that it has a “10,000 bend lifespan.” While we’ve never bent a Cone Aux Cable 10,000 times, we believe them! The wire is covered in a carbon nylon braiding, which is tough while remaining flexible. The insides are made of 100% copper with 24k gold coating, bringing you sweet, quality sound with no compromises. And the best part is you get two of them in a pack for a great price! If you’re looking for great sound within a small budget, check out the UGREEN 90-Degree Cable. It’s a flat, noodle cable. While it looks a little strange (like an alfredo noodle instead of an aux cable), it is designed that way for a reason. The flat shape helps the cables to reject tangles, keeping knots from damaging your cords. Inside, it is made from oxygen-free copper, tipped with sound-boosting 24k gold contacts. It comes in a variety of colors, but only one length (1.5 feet). It also has a sweet, 90-degree angle that makes plugging it in even tight spaces a breeze. But that isn’t even the best part! This super thin, smooth aux cable can is designed to plug into your device even when you have them in bulky cases. What a genius idea! If you want a lifetime warranty with your aux cable, Syncwire Aux Cable has got you covered! This universally compatible cord is braided for ultimate durability. It is gold plated at the ends to help deliver the best sound quality possible and fight corrosion. The Syncwire Aux Cable fights tangles with its braiding so you can wind your cables without a second thought. The super thin connectors fit almost any case, no matter how bulky. This cables also features a double shield technology that helps to prevent interference, so your sound will always be a pure as possible. But the part we like the most is Syncwire’s connector tech that really keeps the sound rolling in. It helps to fight contact issues that arise when the aux cable is not completely connected inside your device. And that means quality sound that you can rely on for life! The iVanky Aux Cable is a universal aux cable that really knows all about quality sound. The interior is constructed of oxygen-free copper wires that have been enameled. These are wrapped in protective AL-Mylar protective foil and a durable exterior coating that helps your cables to survive for almost ever. This is why they can provide a lifetime warranty; their stuff is so well put together! It has even passed a 15,000-time bend test, making it some of the most durable cabling we’ve ever seen. 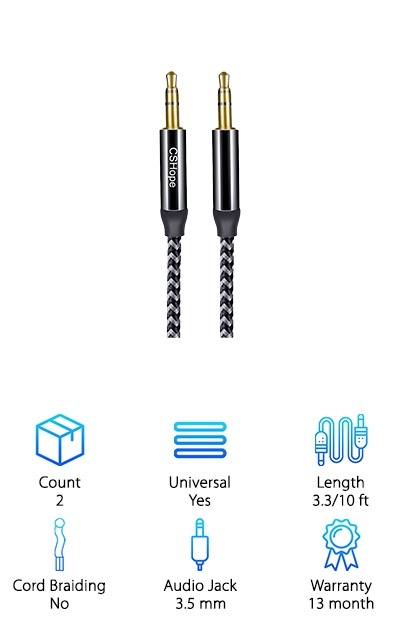 This cable is 3.3 feet long, and each of the male-to-male ends is tipped in 24k gold to give you clean sound and protect your wires from the outside world. All that, and they will work with just about any device you have laying around. The Anker Premium Aux Cable comes in two colors: red and black. These ultra-smooth cables can connect just about any of your devices up, helping you to have the best possible sound through a cable. The durable and high-quality materials all come together to make a great cable; the Anker Premium Aux Cable is made of the same things as many of the most expensive brand cables are made from. They are protected by an 18-month warranty that helps protect your wallet and your purchase. It comes in one length: about four feet. 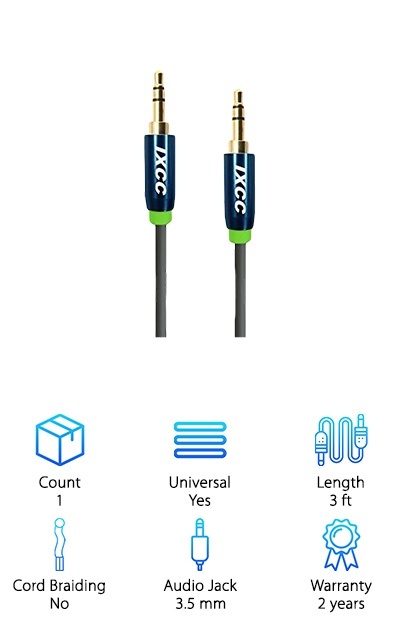 This durable, strong, and thin aux cable is ready for whatever sound equipment you want to hook up, with a few minor exceptions. If you’re looking for a great deal on a great aux cable that won’t let you down, make sure to check out the Anker Premium Aux Cable. Do you need two cables of different lengths? The CSHope Aux Cable comes in both a 10-foot length as well as a 3.3-foot length, both together in the same packaging! So if you need a short cable for the car and a longer one for your home, CSHope has you covered. With these cables, you’ll be ready for just about anything you might need an aux cable for. They are universally compatible and are made from incredibly high-quality materials. These include 24-karat gold plated contacts, stranded copper with a metal housing, and a heavy-duty nylon braiding on the outside. With this, you’ll get max sound and durability. And it’s warrantied for 13 months! 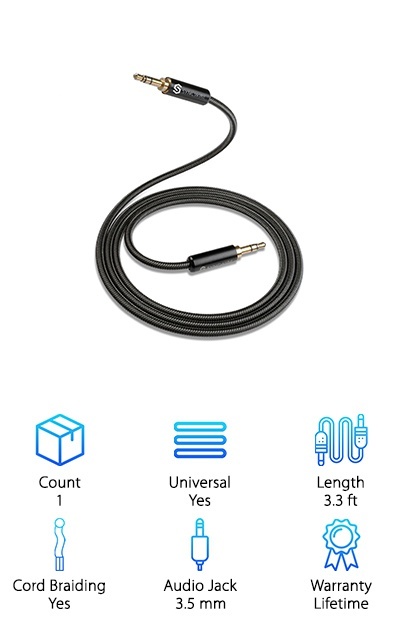 So if you need an aux cable that’s ready for just about anything, you’ll want to take a look at the CSHope Aux Cable. So how does the iXCC Tangle-Free Cable stay tangle free? It’s the clever, tangle-free outer coating of course! These cables come with a 2-year warranty and are compatible with just about any kind of sound equipment. That includes even your smartphones and tablets with bulky cases. This cord is three feet long, but it comes in a variety of other lengths, too. They are very durable; they have been built with longevity in mind. 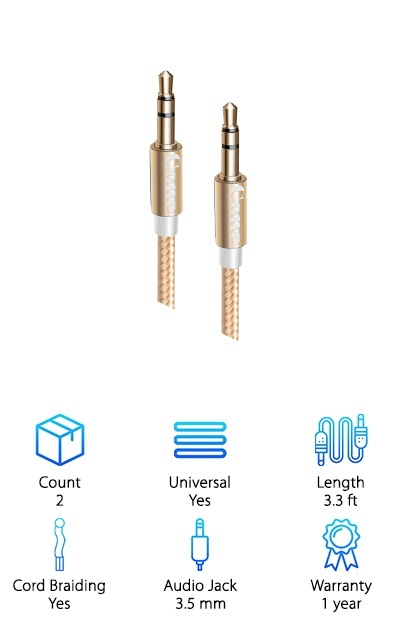 The highly-polished metal connectors are tipped in 24-karat gold and help to fight corrosion and make the sound quality pouring through the wires as clear as possible. It’s three feet of the perfect sound! And, it is also easy to store. So keep on winding up you cables without worrying about damage, kinks, or tangles; you’ve got the iXCC Tangle-Free Cable! And the brand iVanky makes it onto this list a second time! With its long life and lifetime warranty, there’s no way we could include them only once! 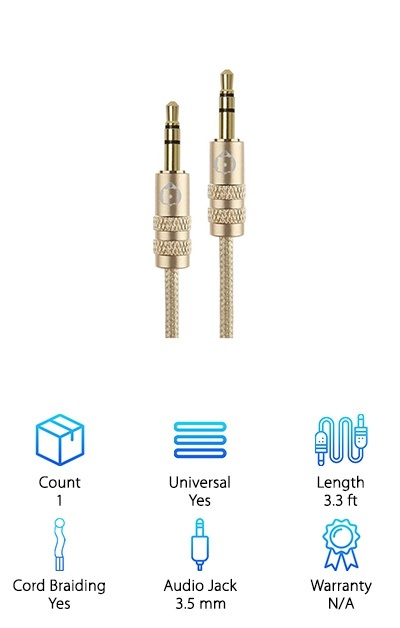 This universal, 3.5 mm, male-to-male connector is formed of a pure copper shell; this helps to get better sound and reduce signal loss. They are also tipped in gold to help fight connection loss and to prevent corrosion. The nylon braided exterior helps to fight kinks, breaks, splits, and tangles. This cable has been evaluated for up to 15,000 bends and passed. It’s ready for even the heaviest usage. The best part? The iVanky also uses vacuum extrusion to hold itself together instead of glue, making it nearly impossible for the wire to come apart. Not to mention this thing is 8 feet in length, giving you the length you need for almost any application. Another great cable with a lifetime warranty! The CableCreation Aux Cable is a braided cord. It comes in 1.5 feet, 3 feet, 6 feet, and 10 feet. It is super slim, making it compatible with even bulky cases. It is made with durability in mind; the inner wire is enameled then wrapped in the tangle-free braided cord. The connector design helps to give you the best possible connect every time, keeping your sound flowing without extra noise or static in the background. And that isn’t even the best part! The CableCreation comes in black and white or in rose and gold. We choose the rose and gold because it’s the prettiest cable we’ve ever seen! 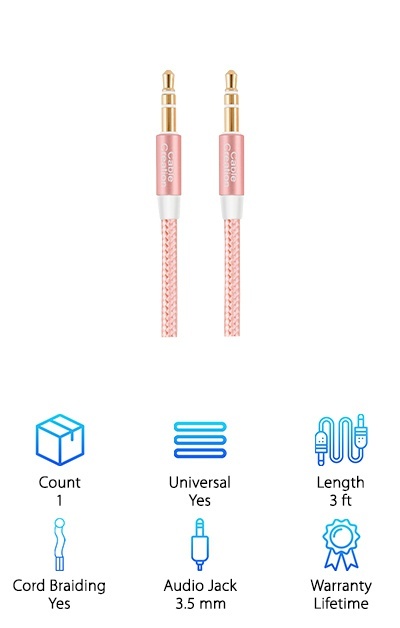 The pink is unique and great to look at, so it’s perfect for an aux cable that can’t be hidden away. The Turtle Brand Aux Cable is built to last! It contains premium metal housing and flexible exterior to help keep your wires protected. The 24-karat gold tips help to prevent corrosion and to help make the best sound possible. It has ultra-thin tips to ensure that this will fit nearly any device, including smartphones with bulky cases. The braided cord is hard to tangle. These guys come in a variety of colors, including gold, black, and pink. A variation on the Turtle aux cables also come without the braided cord and different colors. So you get to choose how you want your cables to look! These beauties are about 3.3 feet of pure, quality sound and high-quality materials that last and look great!